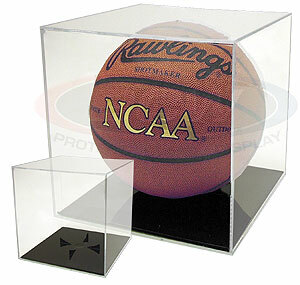 Two piece plastic cube display case holder for a regulation size basketball, with black base and UV protection. Exterior dimensions 9 3/4 x 9 3/4 x 9 3/4 inches; interior dimensions 9 1/2 x 9 1/2 x 9 1/2 inches. DISPLAY CASES ARE NON-RETURNABLE. DUE TO THE SIZE OF THIS CASE, IT CANNOT BE SHIPPED OUTSIDE THE UNITED STATES.